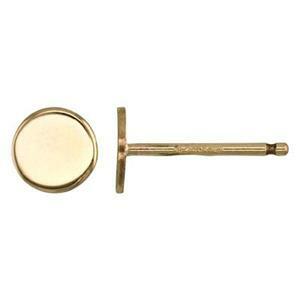 14/20 Gold-Filled 4.1mm 24 gauge Tiny Circle Stud Earrings, .7mm Post Thickness. Clutches Not Included. Order 2pcs to get one pair of earrings. Postpositive! Whether you’re here to make jewelry creative – or to make creative jewelry – it’s all Postpositive! These little 14/20 Yellow Gold Filled 24 gauge Tiny Circle Stud Earrings with a .7mm Post, look just like a little piece of confetti, or an individual sprinkle from a party cupcake. Little simple spangles when your current outing requires uncomplicated attire or attire uncomplicated. Also ideal for use with creative earring jackets. Looking for this is Rose Gold Filled? See The GFR30R.